Summary: Researchers have developed new technology that utilises infrared light in order to treat memory loss conditions. New method uses near infrared light to shed light on memory loss conditions. Researchers at Hiroshima University have developed a new laser activated technique for bridging missing links in memory flow. The brainchild of Professor Manabu Abe of Hiroshima Universities Department of Chemistry, it aims to open up the mysterious world of neurotransmission – increasing our understanding of the mechanisms involved and potentially leading to treatments for memory loss conditions. Memory involves the successful flow of neurotransmitters from neuron to neuron. When memory breaks down, we know there must be a gap in this flow but we currently don’t know where to start in terms of bridging it! In fact, our understanding of neurotransmission in general is filled with holes, limiting the development of treatments for memory loss. Neuron after laser projection – red squares indicate high calcium concentration. Credit: Hiroshima University. While scientists are aware that stimulation of neurotransmitters such as glutamate is required for functioning memory, where and how these chemical messengers are produced remains a mystery. What is known is that calcium has a critical role to play – its concentration increases prior to glutamates release, but again the mechanisms are poorly understood. This is due to calcium’s elusiveness in neuron cells where it exists as a dissolved salt, making it difficult to control or detect. Using Professor Abe’s technique, it is hoped that the production sites of chemical messengers within neurons can be sourced, studied and even rebooted as required to reestablish flows between neurons and so boost memory. HU’s pioneering laser proposal for exploring the world of memory flow incorporates two distinct phases – capture and release. The first phase involves “carrier molecules”. When applied to the body via spray, these synthesized molecules diffuse independently into neuron cells – capturing and holding in place any calcium they encounter by bonding favorably with it. However, calcium suspended in place, is of little use in memory experiments unless it can actually be detected. To solve this dilemma chromophores – essentially light sensitive antennae – were incorporated into the carriers giving them light absorbing properties. When near-infrared light is projected at these modified carriers they break down via two-photon emission. This break down, using light capable of penetrating tissue without damaging it, makes it particularly useful for internal use in living organisms via external control using lasers! In the lab near-infrared lasers were projected at neuron cells containing these light sensitive carriers to see if calcium was released. When the electrical charge at each laser-beam penetration point was recorded, an interesting pattern emerged – there was a wide in the charges detected, but what could this mean? Calcium Carriers holding calcium in place and releasing it on exposure to near infrared light NeuroscienceNews.com image is credited to Hiroshima University. It seems that exposure to the electromagnetic wave broke down the light sensitive calcium-carrier molecules as planned – causing them to shed their electrically charged calcium cation. As calcium only exists at specific neurotransmitter production areas in neurons, a higher charge was detected in these points. As this only happened in specific precise areas and at relatively high levels – it could also be deduced that the elusive sites of calcium concentration in neurons had finally been found. Scientists can now focus on these precise points of neurotransmitter production to develop treatments for memory loss. Weather by observing how these areas respond to medication or by introducing outside sourced glutamate to neurons which are not functioning, a whole new world of possibilities has opened up for scientists wanting to keep the memories flowing. Image Source: NeuroscienceNews.com images are credited to Hiroshima University. Hiroshima University “Lasers Could Be Key to Unlocking Memory.” NeuroscienceNews. NeuroscienceNews, 5 February 2017. Hiroshima University “Lasers Could Be Key to Unlocking Memory.” http://neurosciencenews.com/infrared-memory-6061/ (accessed February 5, 2017). Among biologically active compounds, calcium ions (Ca2+) are one of the most important species in cell physiological functions. 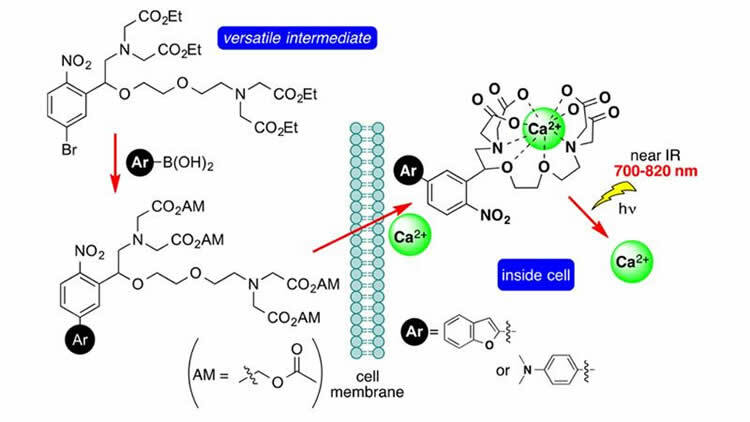 Development of new calcium chelators with two-photon absorption (TPA) properties is a state-of-the-art challenge for chemists. In this study, we report the first and efficient synthesis of 5-bromo-2-nitrobenzyl-substituted ethylene glycol tetraacetic acid (EGTA) as a platform for a new generation of calcium chelators with TPA properties in the near-infrared region. New calcium chelators with high TPA properties, that is, a two-photon (TP) fragmentation efficiency of δu = 20.7 GM at 740 nm for 2-(4-nitrophenyl)benzofuran (NPBF)-substituted EGTA (NPBF-EGTA, Kd = 272 nM) and δu = 7.8 GM at 800 nm for 4-amino-4′-nitro-1,1′-biphenyl (BP)-substituted EGTA (BP-EGTA, Kd = 440 nM) derivatives, were synthesized using Suzuki–Miyaura coupling reactions of the bromide with benzofuran-2-boronic acid and 4-(dimethylamino)phenyl boronic acid, respectively. The corresponding acetoxymethyl (AM) esters were prepared and successfully applied to the Ca2+-uncaging reaction triggered by TP photolysis in vivo.